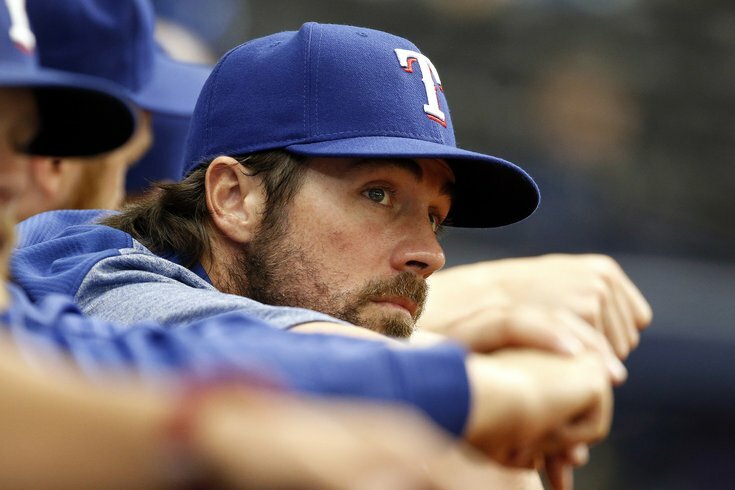 Texas Rangers pitcher Cole Hamels watches from the dugout. The Phillies haven't done much in free agency since GM Matt Klentak officially introduced their prized singing, first baseman Carlos Santana, but often, it's when things are quietest that the most work is getting done. And based on what they've done to this point in what appears to be the first winter of spending in some time for the Phils, there's no reason to believe they're done. The team has made its desire to add starting pitching well known, and most of the top-tier free agents remain on the market. They still have plenty of money to spend – and prospects to spare should they decide to go the trade route instead. With several different ways to go, there's no need for the Phillies to be overly aggressive, and they know that. But they seem ready to win, sooner rather than later, and if they plan on doing that in 2018, they're going to need a few more pieces first. Over at ESPN, they took a look at the most likely landing spots for the top remaining free agents. And according to David Schoenfield, the Phillies might land a starting pitcher after all. No, it's not Jake Arrietta or Yu Darvish, but it wouldn't be a bad consolation prize. Don’t take that best bet too seriously: Cobb could land in a dozen places. The Carlos Santana signing and immense flexibility in payroll, however, mean the Phillies could emerge as Cobb’s top suitor as they continue to build for 2019 and beyond. If the Cubs consider Darvish’s price too steep or if he signs elsewhere, Cobb provides an alternative plan at about half the price. Prices for top young starting pitchers like Gerrit Cole and Chris Archer are exorbitant and would put a gaping hole in the Phillies' young core. It's possible that the Phillies will make only a modest addition to the rotation before spring training while gearing up for a July strike on the trade market. If the Texas Rangers fall out of the race, keep an eye on Cole Hamels. Both sides would have interest in a reunion someday. The Phillies have been tied to Marlins outfielder Christian Yelich since before Derek Jeter turned the organization into a furniture store undergoing liquidation. But after several head-scratching moves from Miami, including dealing slugger Giancarlo Stanton to the Yankees last month, it appears the Phillies are still interested, despite already having complicated their outfield situation by signing Carlos Santana to a big deal (and presumably moving Rhys Hoskins to the outfield. The Phillies are one team that have spoken to Marlins about Yelich and have a wealth of intriguing prospects that could interest MIA. Yelich, owed a total of $58.25M over the next five seasons if a 2022 option is picked up, is one of baseball's most promising young players. The Marlins outfielder is coming off a .282/.369/.439 season that equated out to a 117 OPS+. Since becoming a regular in 2014, Yelich's OPS+ sits at 121. In terms of prospects the Phillies could send back to the Marlins, Sixto Sanchez, Scott Kingery and J.P. Crawford are likely the three most-coveted names. But assuming they're considered untouchable, what could the Phillies give up for Yelich? Would Yelich actually be an upgrade? There's no doubt that adding Yelich to the Phillies lineup would make it more dangerous than its been in years, but is it worth it, especially considering what it would mean for the development of the organization's other young outfielders. But would Yelich be an upgrade over what the Phillies already have? In some ways yes, and in some ways, not really. The Phillies reportedly signed a pair of players to minor-league contracts on Tuesday (or are at least close to doing so). Former Red Sox third baseman Will Middlebrooks likely will sign a minor-league deal with the Phillies. Source: Phillies agree to minor-league deal with ex-Rays reliever Steve Geltz. Made 108 appearances for TB from 2014-16. The Phillies have confirmed that in addition to Middlebrooks and Geltz, they have also signed eight other players to minor-league deals with invitations to spring training as non-roster invitees. They are: RHP Pedro Beato, INF Pedro Florimón, C Eric Fryer, C/1B/OF Matt McBride (a Bethlehem, Pa. native), INF Heiker Meneses, C Logan Moore, OF Danny Ortiz, and INF Mitch Walding.